Taking cues from materials that surround her, she incorporates objects like electric fuses, concrete, steel nozzles, clamps and ball bearings to form accessories that spruce up daily wear with ease. “Art and fashion always attracted me and I had a natural flair for design. So studying fashion seemed like an obvious choice,” shares Advaeita Mathur. 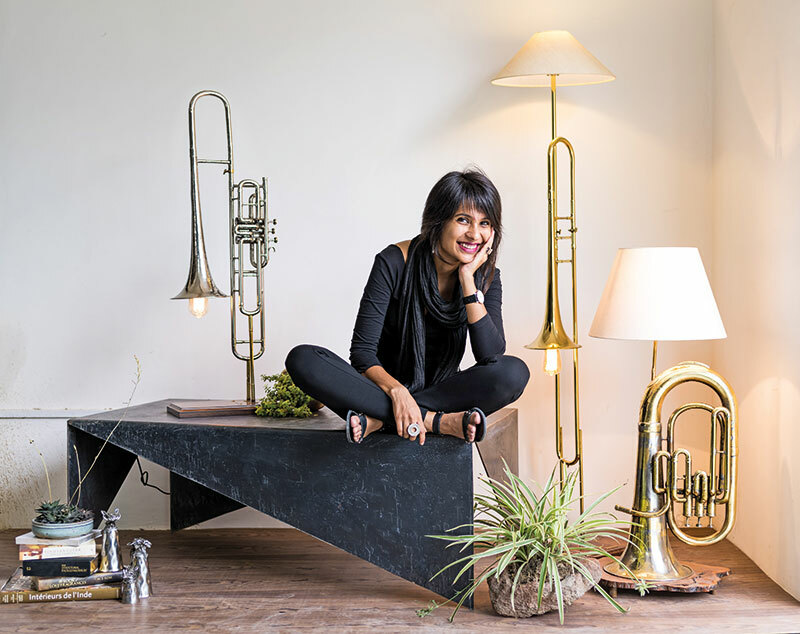 Handcrafted in Delhi, her brand Studio Metallurgy celebrates individuality. “My first collection was created as a result of weekends spent in Old Delhi. Scouting bits of raw materials and bric-a-brac is something I love doing. The precision and minimalism inherent to industrial machinery forms the basis of my aesthetic. I build upon that by picking a new concept or technique for each collection to set it apart,” explains the Istituto Marangoni (Milan) alumnus. Brass is her preferred metal of choice — because it shines like “liquid gold” when polished. But her recent projects — forays into product design — fuse together wood and metal; to form a paradox of organic and mechanical shapes through beautiful, collectable objects. Vintage Instrument Lamps use salvaged and restored musical instruments, while another line includes a series of peg tables where hot metal is poured onto the surface to create one-of-a-kind forms. She appreciates another Delhi-based label En Inde’s work for their finish and aesthetic. Advaeita’s products, a result of extensive research, experiment with unusual materials that give them a certain edge. “In the future, I hope to build upon my range of contemporary jewellery and home decor. Keep an eye out for the Molten Woods Project!” she concludes.